A captivating embrace of sweet dried fruits notes with licorice, Juniper pepper and grilled touches with a spicy long lasting aftertaste. Dark, intense and with wonderful aromas of hazelnut and licorice, Ristretto Ardenza takes the classic espresso to another level. A little shorter, Ristretto is made by passing less water through the coffee. 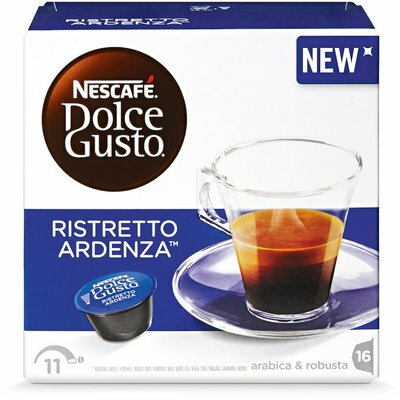 What this means is that you get a short, robust espresso that has a smoky aroma with a deliciously peppery aftertaste. Our Ristretto Ardenza capsule coffee is our most intense coffee capsule drink yet, so if you love the full-bodied taste of a bold espresso, this one is definitely worth a try. Also known as ‘corto’, Italian for ‘short’, Ristretto Ardenza is definitely proof that good things come in small packages. As well as a wonderfully woody character with a bold, hazelnutty taste, these punchy espressos are also topped with a silky layer of crema thanks to the maximum 15-bar pump pressure in our stylish machines. The colour of caramel, the delicious crema is frothy, rich and helps give your espresso pod coffee a high quality taste, just as you would expect from a coffee shop.